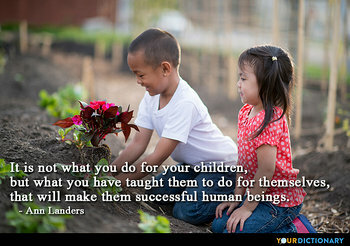 It is not what you do for your children, but what you have taught them to do for themselves, that will make them successful human beings. Sensual pleasures have the fleeting brilliance of a comet; a happy marriage has the tranquility of a lovely sunset. Some people believe holding on and hanging in there are signs of great strength. However, there are times when it takes much more strength to know when to let go and then do it. If you think education is expensive -- try ignorance.